Immigrant right supporters converged at Lawrence High School this weekend to fiercely counter the state’s intention to join the racist “Secure Communities” program. Under the guise of public safety, “S-Comm” cross checks the fingerprints of arrestees submitted by local law enforcement against the Homeland Security's database. Yet the vast majority of those detained and deported are working immigrants who have committed no crime, including those arrested unlawfully or for minor offenses, or those who eventually have their charges dropped. Right-wing groups hoped to pack the Saturday meeting with their bigoted message, with the Marlborough Tea Party organizing a bus to Lawrence. They were met by strong community voices that denounced the racist partnership between the federal and state governments and Gov. Deval Patrick’s intention to join the program. Natalicia Tracy, executive director of the Brazilian Immigrant Center, likened the program and anti-immigrant attacks to Jim Crow laws of the south and racist attacks targeting Black people. Other speakers at the meeting included representatives of the Boston May Day Committee, MassCOSH, New Sanctuary Movement, the Brazilian Women's Group, MIRA, and the ACLU. The public hearing was the third in a series organized by the Patrick administration to ostensibly give the community a voice—all while his administration repeatedly states its intention to join the anti-immigrant federal program. The meetings are meant to give the appearance of community input when, in fact, the Patrick administration has already set its course. Rather than sitting quietly, immigrant right supporters have used the meetings to expose the racist agenda. In Suffolk County, the only jurisdiction in the state currently enrolled, 68 percent of those detained and deported have been “non-criminals” — the sixth highest percentage in the country. 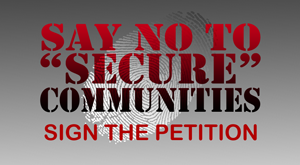 Help ANSWER Boston continue to mobilize against the racist Secure Communities program by making a donation today.